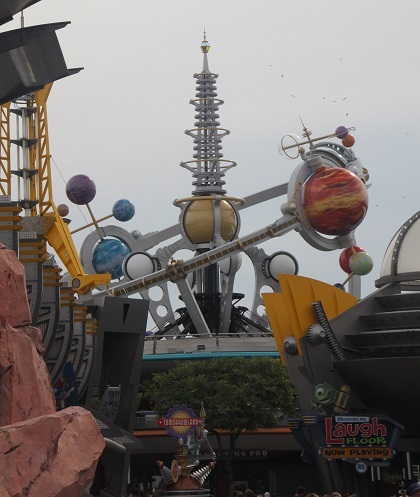 My first visit to Disney and the Magic Kingdom, I have to admit Tomorrowland was probably my least favourite land. Something has happened in the meantime however and I left this time feeling it was one of my favourites. 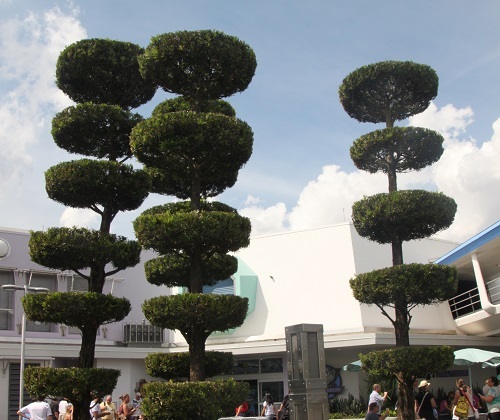 Disney originally designed this area to be a glimpse of the future. Obviously that quickly goes out of date so they reinvented the whole place to depict the future as viewed by science fiction from the 1920’s and 1930’s. The architecture is all neon, glass and metal. 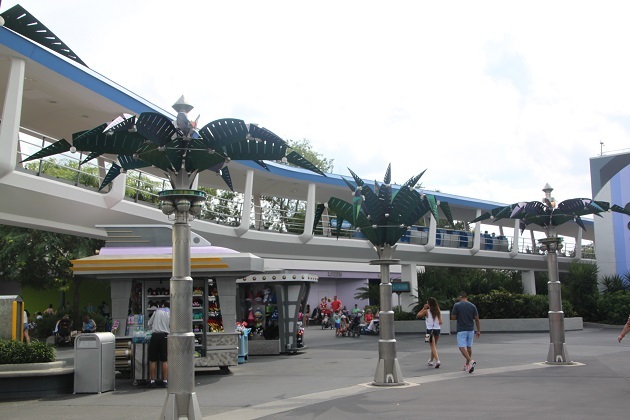 We especially loved the metal palm trees – they actually react to light. Like flowers they fold up at night and open during the day to collect solar energy. Space Mountain is probably the most popular and well known attraction in this area, if not the whole park but we decided to give it a miss. Lines were long for a start, my wimp status when it comes to rollercoasters has increased dramatically and Husband prefers much more thrills and spills with his coasters, so no Space Mountain for us. We started off our visit at Monsters Inc Laugh Floor, an interactive comedy show, the jokes are a bit cheesy but the improvised sections of the whole thing are really good. Son was more than thrilled when a bright light picked out Husband in the audience and he was selected to be “That Guy.” Husband was not quite so ecstatic when he kept appearing on the large screen throughout the performance and was used as the punch line for most of the jokes. Needless to say Son and I found his humiliation utterly hilarious and loved the show probably mainly due to that. Husband did get a sticker at the end as a souvenir…. 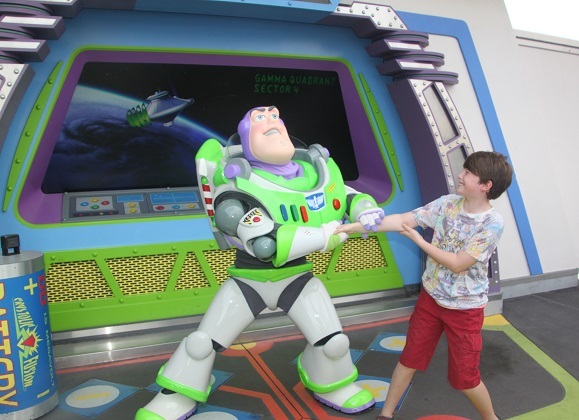 Buzz Lightyear’s Space Ranger Spin, an interactive ride set in the world of Toy Story with scenes scaled down to the size of toys saw us spin through trying to shoot lasers at various targets – we were literally in the middle of a giant arcade game. Son took control of the joystick and made it a nightmare to try and hit anything. He focused on spinning and discarded the shooting so we scored none too well. Husband on the other hand got his competitive head on and scored top marks with his lasers – we were trounced. I remember on my first ever visit to the Magic Kingdom being caught in a massive downpour, the rain pounded down and we had no coats. Husband and I hopped on board the People Mover and stayed on for about 40 minutes until the rain stopped. No weather problems this time but we still jumped on board this gentle and relaxing ride – a great place to get a bit of a rest and respite from the hot Florida sun. Definitely not thrilling but then that is the point, a chance to relax and enjoy the sights and sounds. 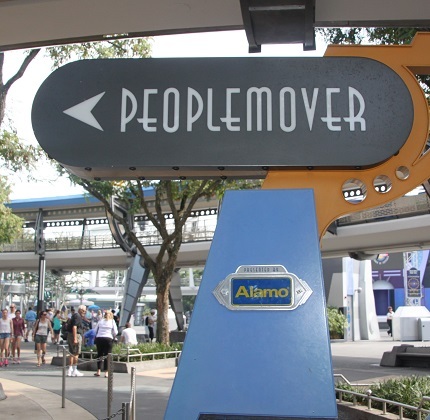 It travels through the middle of Space Mountain and features a portion of a model for the original plan of EPCOT, takes 10 minutes and travels 1 mile. 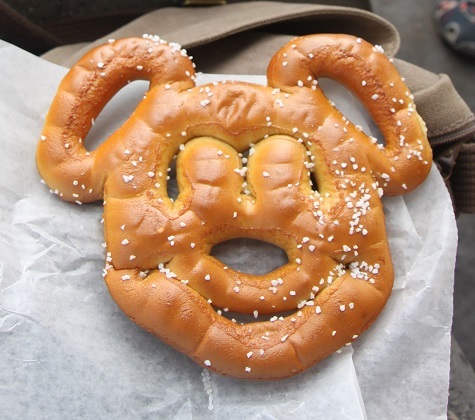 A stall selling Mickey pretzels could not be ignored…. 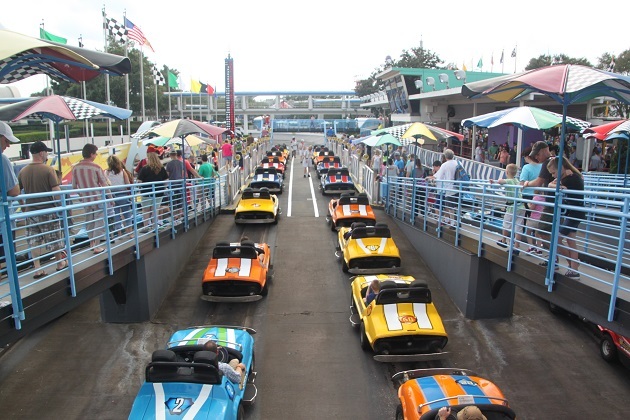 The Tomorrowland Speedway is not my favourite thing – I like the theming and the Indy car racing track but find the cars a bit lame and difficult to steer. Son didn’t agree with this view – he loved it so we rode it twice. The top speed is 7 miles an hour but I don’t think you would ever reach that and the rail in the centre means you aren’t really driving. The roar of the sports cars and the smell of exhaust fumes does make it feel quite authentic. A couple of the other rides got a bit of a thumbs down from us. Stich’s Great Escape – a show in the dark where Stitch escapes and you are in a harness was a bit claustrophobic and not much fun (for me especially). 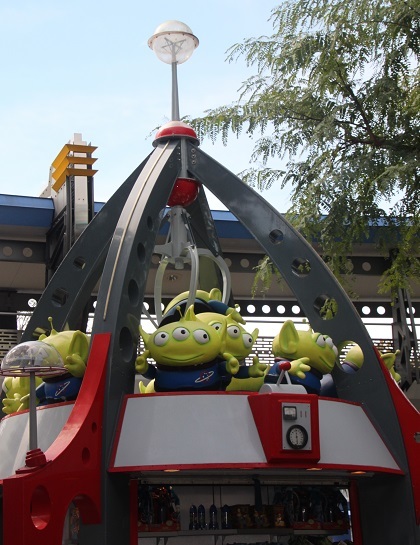 We rode the Astro Orbiter – a 2 person rocket-like spaceship which is 50 feet in the air and has some great views. After a couple of spins I forgot about the views – those rockets made me (and Husband) so incredibly queasy as they spun around. Son was fine. We just experienced utter relief disembarking. My favourite part of this whole area though and the thing we left until last was the Carousel of Progress. I’d never noticed it in previous Disney visits, no idea how I could have missed this gem. We all loved it. A stage show it debuted in New York in the 1964 World Fair and follows an animatronic family from the early 1900’s to the turn of the 21st century. It focuses on technological innovations and how we live our lives. Apparently this was Walt Disney’s favourite attraction – amazing to think it is 50 years old. The figures are extremely lifelike and the whole concept where the audience revolves around a circle of 6 theatres connected by divider walls is so clever and different. Add to that classic Sherman Brothers music and it is just magical. I found the whole thing uplifting, optimistic and just really special. No way to top this so it was home with Great Big Beautiful Tomorrow still playing in our heads. Your poor husband! I would want to curl up and die if that happened to me. If there’s ever a tiny hint of potential audience participation I to to find an inconspicuous seat. But maybe they look for that…..
Me too Anabel – not my thing at all!! Not his either to be honest but he did choose the seats at this show so I put the blame firmly in his lap. I think maybe they can also smell fear and reluctance…..
We loved it too but got terrible scores!! think we rode it at least twice. The pretzels seem to be our son’s staple lunch dish when we’re in Orlando – this one was an extra hit because of the Mickey shape!! We are still chuckling about that show and his sticker!! 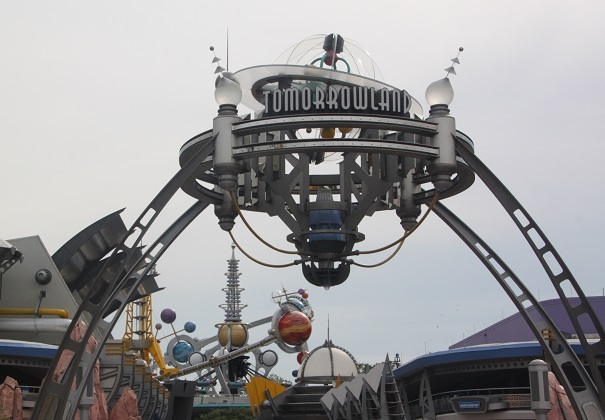 I remember Tomorrowland being very disappointing – a bit like mini EPCOT – also very disappointing! That was my lasting memory but it changed this time. I think the Carousel of Progress which I really liked and the utter humiliation of my husband in that show probably raised it all a notch or two for me!! Carousel of Progress is one of my all time favorites. A little dated now but still so nostalgic and optimistic 🙂 I also love Space Mountain though- we do it at least twice on each trip! I’d seen Carousel of Progress before on all my other times here and was just charmed by it. I have done Space Mountain in the past but seem to have just turned into a complete and utter wimp where coasters are concerned, maybe I need to give it another go next time!! It is a fun place to explore. Joy, you have convinced me that when our little granddaughter arrives , she will get a trip to Disney World when she gets big enough to enjoy it! That’s a must Pam – you will enjoy it every bit as much as she does!! I can just imagine how funny it was to watch you husband on the big screen the whole time! 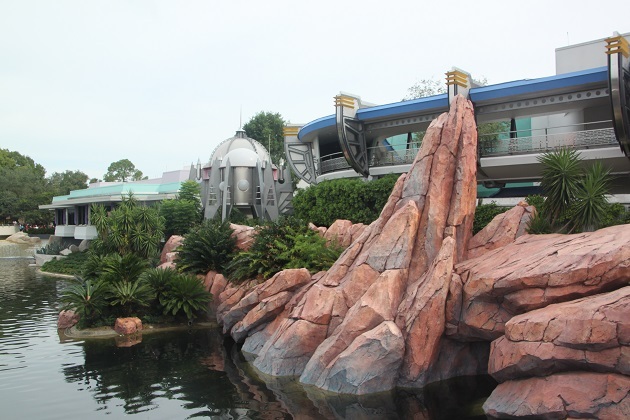 The only thing I can remember from this land was Space Mountain – I loved it! But think my son would love the Monster Inc laughing floor – he’s a big fan! It was hilarious, can’t tell you how much we laughed!! That ride was just the most awful thing Rosemary. My husband (but not me!!) rides the biggest baddest rollercoasters no problem but this tipped him right over the edge!! We loved that he got picked on in the show – so funny. Henry seems to have passed through with no major problems but just waiting for baited breath for the next one….. seems like this grey, wet and windy weather will never cease. Hopefully it will be long gone by the time you travel back!! Hope you have a great weekend too Rosemary!